All of the Hebrew letters have pictures and numeric value to them. 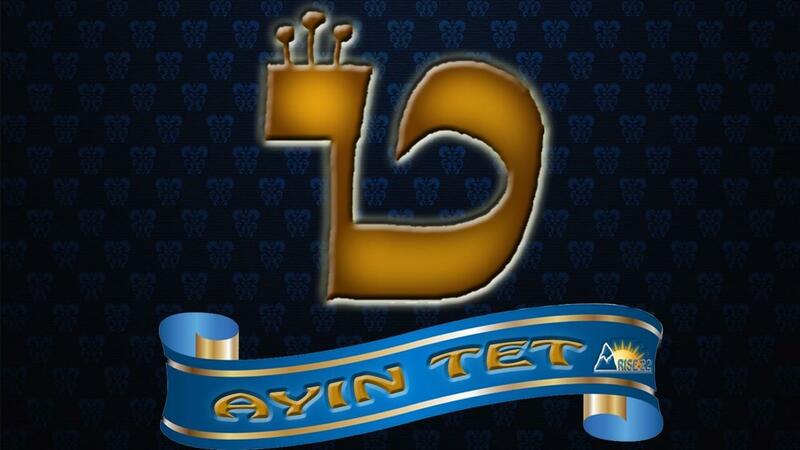 Many of you know the word Ayin Tet is the number 79 which breaks down into 70+9 to equal 79. The 70 is the word Ayin which means to see. So the whole decade of the 70s is wrapped with the theme to see. Each number that follows draws us deeper into the mystery of revelations the Lord has hidden in the Hebrew language to communicate to His children, secrets that will position us for a year of success if we pay attention. take heed and follow. The word tet is the ninth letter of the Aleph-Bet, having the numeric value of nine. The pictograph for tet is said to be a snake coiled inside a basket. Ayin Tet is constructed of two preceding letters, Vav and Zayin, also joined and somewhat resembling a snake. The number 9 is also the number of fruitfulness and fruitfulness of the womb so it is the number of birthing. Women carry children for 9 months before birthing which makes the 9th month of September prophetically a birthing month. The mystery of Tet is because it is a paradoxical letter in that it reveals both good and evil. This letter looks like a woman that is pregnant with child, a snake and someone bowing to a crown. This is why the interpretation is a paradox of this year being a year of both good and evil. Now let’s break down the revelations of how to walk in the good God has for you this year. Ayin means to see so God is telling us this decade and especially this year that your perspective or how you see things will determine what you get. How you see things determines what you say. If you see yourself with no money you will say I can’t afford that. If you see yourself sick you will say you're sick instead of calling those things that be not as though they are and say I’m healed. You will look at the glass half empty instead of half full. You will see yourself as a grasshopper to the giant challenges in your life like the children of Israel did going into their promised land. You can choose good or evil. In the same scenario, you can see the huge obstacles standing in the way of the life you've always dreamed of as bread for you like Caleb and Joshua did. The 12 spies all seen the same thing but only two came back with the right perspective when presented with the choice to see good or see evil. The 2 spies Caleb and Joshua were the only two out of the 12 that were able to step into the promise land and it was because of their perspective on what they saw. This year it will be imperative for you to see things the way God does so that you can birth into manifestation the promises that the Lord has for you. This is where I like to say it gets gooder and gooder. There are many words that have the numeric value of 79. The significant ones Holy Spirit pointed out to me are prophet, pen and touch. Let’s look at Moses and unravel the depth of revelation I was shown. I declare that you shall not go empty! You shall not go empty of love, friendships, ideas, money, health and anything else you need to walk out your calling. No my friend, in this year of 5779 you shall see the goodness of God in the land of the living. The word behold is the Hebrew word aman which means faith. It’s translated behold because faith causes you to see. In fact, it’s the evidence of things not seen according to Heberw 11:1. God’s response to Moses is where the words prophet, pen and touch come into play. God said to Moses “What is in your hand” Moses replied “a rod”. To get this we have to understand that hand is symbolic of strength and power. It’s symbolic of our creative ability to hand craft how we clothe or cover ourselves in life. Are you clothing yourself with wealth or poverty? Honor or Shame? Hand is symbolic of our ability to put our hands to something to work. We by our hands work out the details of our lives. Psalms 1:3 says that whatever you touch will proper. Let’s look at the symbolic meaning of hand. When you see hand in scripture one of the symbolic meanings is related to your mouth. For example, Psalms 102:25 says the heavens are a work of his hands but we know from Genesis that God spoke everything into existence. God said let there be a firmament and God called the firmament Heaven. God was asking Moses what was in his hand because Moses said they won’t believe what I say. God was really asking Moses what is in your mouth? God was trying to get Moses to see that he was speaking the wrong thing because Moses was saying they will not believe him. God already told him he would not go empty. This included his words being empty of power, backing and authority. When God asked this question, Moses said a rod. The rod is the symbol of Authority and when God told Moses to cast it down it turned into a snake. Did you get it? What was good turned into a snake a representation of evil because Moses didn’t see by Faith that God would be backing what he said. This year see the creative hand of your mouth is powerful so you can be the prophet of your own life and declare what God tells you to say. God told Moses to cast down his rod symbolic of his authority which was in his hand symbolic of his mouth. Moses was not seeing the right perspective of the authority of the words coming from his mouth so his rod turned into a snake symbolic of evil. What we don’t use correctly or at all the devil will use for his devices. This is how the world takes things that were to be created for God’s purposes like entertainment and uses it for destruction. It’s time that believers take their positions of influence in the 7 mountains or Satan will continue to wiggle and squirm his way into our schools, technology, government, sports and everything else he can. This is the evil side of Ayin Tet but God did not leave Moses there. He told Moses to pick up the snake by the hand. Again, Moses had to use his hand symbolic of using his mouth to speak. When Moses grabbed the snake with his hand the snake turned back into a rod. God is saying this year, what the devil meant for evil He is going to turn it around and use it for good when we began to speak words of life. As we speak words of life we will walk in the fruits of the Spirit and this will be a year where the nine fruits of the Spirit overcome evil with good. Where the 9 gifts of the Spirit are in operation to help us to speak words of wisdom and knowledge, tongues and interpretations. This year our mouths will be the pen of a ready writer. Remember the word prophet, pen and touch have the numeric value of 79. In psalms 45:1 we see all three in motion. When you touch the King (which has the idea of a hand) it will be the things you have made with the tongue in your mouth. Your tongue is a pen this year to write the script for the role you get to play in starring you. Make it an epic film. Make it a Blockbuster film for the world to see you arise and shine. Oh yea, and a couple more things…. Rosh Hashanah started on the 9th day of our 9th month in combination is 99. Also, 9+9 is Eighteen for 2018. This is a date set up by God to start the year off prophetically with signs and wonders. Let me put all the prophetic revelations in a list for you.